Today, Judi and Clint Madsen from Green Fairy Quilts have generously sponsored a giveway of layer cake of Gardenvale, by Jen Kingwell! When Clint suggested a give away, I suggested the Gardenvale Layer Cake because I know several of you are making or considering making a Jen Kingwell pattern. I am just now ready to get started on her My Small World quilt pattern. After I met Jen and Richard at Quilt Market and saw her actual quilt, I was sold - even though this is not my usual style, I am making it anyway. My copy of Quilt Mania - with the pattern in it - even arrived from France late last week. I was thinking that if you were working on one of Jen's scrappy quilt patterns, a layer cake of her own fabrics would be a nice addition to your fabric options. Let me tell you a bit about Green Fairy Quilts. 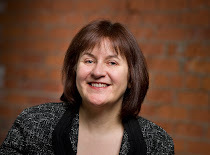 Judi Madsen - her beautiful blog is here - is a fantastic, award winning long arm quilter, author, and pattern designer. Her work is stunning and inspirational. The shop is run by Clint, who selects the fabric, runs all aspects of the website and takes care of customer service. He is a dream to deal with, always quick to respond to a request or question. I regularly purchase from Green Fairy Quilts and am never disappointed. They focus on a wide selection of the best priced precuts, threads and notions. In fact, Green Fairy Quilts is prepared to beat any advertised price plus shipping costs from that shop with their price plus shipping costs, auctions excluded. They also have free shipping in the USA and free shipping for larger orders for the rest of the world. Besides fabrics, I have purchased a lot of beautiful thread from Green Fairy Quilts, they have a huge selection. Besides the prices and products, I love the excellent customer service. If you follow me somewhere, on the blog or elsewhere - I'm shecanquilt most everywhere - leave a third comment letting me know where and how. Edit: Please, please, leave me your email or your instagram or twitter handle or some way to find you if you win! I was about to reply to the comment of "bidtl" to say I have won a give away as commenter #1 but she is no reply. I'll leave this give away open until about 6:00 a.m. Monday June 29 and I'll announce the winner then. Now I am off to have dinner and then to start pulling fabrics for my quilt. I plan on doing a lot of quilting this summer, along with hitting the beach and spending time enjoying the sun - assuming the weather here cooperates! What a great giveaway! I have signed up for the Green Fairy Quilts Newsletter! And I follow your blog and on Instagram! I am anxiously awaiting my own Small World pattern from France. I am also a reader of Green Fairy Quilts Newsletter, and recently been following your blog. So I have all the requirements to be a winner, except that I seem to be commenter number 1. Sigh. Everyone knows that in a random number selection, 1 is rarely picked. I guess I'll just sew along with you when you start the Small world quilt. Summer plans are mostly house projects and finishing up some quilt ufo's! I plan on quilt making as much as possible this summer. I already get their newsletter and have ordered from them many times! They are a great shop and always have good sales and free shipping. I follow you on Bloglovin and on Instagram. Traveling to see my family this summer. Looking forward to seeing my niece and nephew! I already receive the Green Fairy newsletter. Thanks! I follow you on Bloglovin. Thanks for an awesome giveaway! 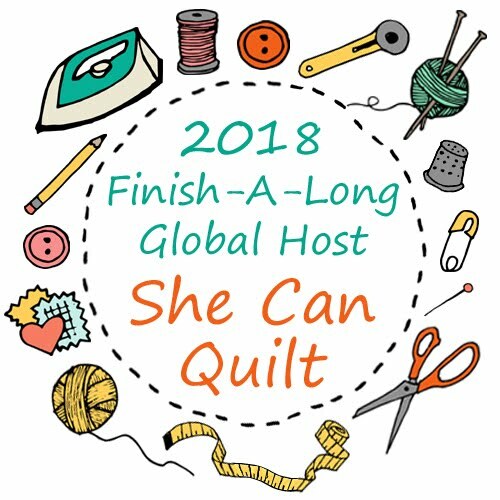 Happy to follow GFQuilts on FB ! I already receive the Green Fairy Quilt newsletter. I follow She Can Quilt through Bloglovin. Hello, happy to picnic with friends and family during the nice days of summer ! Thank You for a neat giveaway ! I follow you via Bloglovin & also by email. I'm teaching summer school, sewing, and playing with my four year old granddaughter this summer. Thanks for the chance to win! I get the Green Fairy newsletter. Thanks again! I follow you on Bloglovin. I'm looking forward to seeing your My Small World quilt. I love this pattern! This weekend my son gets married. Next weekend we visit my inlaws in Pittsburgh and then the following weekend we move the new couple from Birmingham to Atlanta. I don't think I'll get a real vacation this year. Love your quilts, especially "Canvas". Leaving in a few days for three weeks in Spain! I do get the Green Fairy newsletter. Always love looking at their sales. I follow you both on your blog and on IG. Thanks muchly for the giveaway! My summer plans include the vacation I am on right now...in Breckenridge! We are enjoying the mountains and the cool weather. On our way home, we will stop in Kansas City and see The Rolling Stones on tour. Even when I'm on vacation, I get the itch to stitch and can't wait to get home to start! I am a follower of yours on Bloglovin'! I have been a Green Fairy newsletter subscriber for a while now and have ordered from them too! I just finished my summer vacation. My hubby and I bought an acreage as a recreational property (and maybe a retirement property), and we spent three weeks there loving the peace and quiet and getting to know the area. It was wonderful! Summer plans include a family reunion. I subscribe to Green Fairy Quilts. I just found out my brother is getting married in August so hopefully I will be able to make a trip to Florida to attend and meet my new SIL. I am following your blog with bloglovin. Thanks for the great giveaway. We are going to NY in August. Can't wait. Green Fairy is a dream to order from. Camping and hiking seem to be the scheduled highlights this summer. I get Green Fairy's newsletter at my yahoo address. I love Green Fairy, they're awesome! Great prices, selection and service. Subscribe to their newsletter, they're always having sales, thanks! My daughter is on a swim team, so our Wednesday night's, Saturday mornings and weekdays are filled with swimming related activities....next week is Girl Scout day camp for both of us. Summer holiday plans are gardening, quilting, swimming with my boys, maybe a bit of travelling. Thanks for the chance! I get the Green Fairy Quilts newsletter already. And I follow you on Blogger. My summer plans going to outdoor summer music concerts, visiting family, and of course finishing up 2 birthday quilts by mid August. I follow you on bloglovin.com...love your blogs..
A wonderful give-away Leanne! I’m celebrating a Jennifer Kingwell Summer, working on three of her quilts, so winning a layer cake of Gardenvale would be extra awesome! 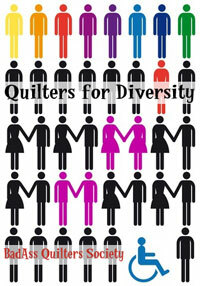 I’ve subscribed to the Green Fairy Quilts newsletter! I’m following your blog via Feedly and your photo’s via Flickr and Instagram! I follow Green Fairy quilts, i love that you get previews of ranges coming up and then of course there is the eye candy of Judi's work. My summer will involve canning, quilting and bird watching. Oh yes tring to stay cool. Summer for me: beach, library, pool, repeat. Two little kids not in school need to be amused somehow, and they don't love quilting as much as I do! PS I love this fabric. And I follow you through feedly, thanks! Beautiful fabrics! My plans for summer are sleep, quilt, bike, and procrastinate! I am a Bloglovin follower, and love your blog! Summer feels like it's slipping away already. I plan to take walks and sew but am sticking close to home. I have already had my summer vacation. I will work the rest of the summer, and I am hoping for better weather so I can enjoy some warmth! I'm going to South America in the autumn( when it's their spring). Great fabric! Beautiful fabric. Some summer weather would be good to go with the Summer months! Two weeks winter school holidays are starting this weekend and I plan to do a lot of sewing! Summer plans are mostly traveling to visit family and friends, then stay home to have time to quilt! I'm mostly sewing and painting the interior of our house. We've just got back from Ireland and we have a trip to Scotland planned for September! Staying indoors is my summertime plan! So, while I'm in, I'll just quilt. Green Fairy always has great deals, and I'm signed up for their newsletter to keep up with them all. Summer = vacations with both sides of the family. I plan to enjoy our garden and beautiful flowers this summer. Last year, I was sick and spent the summer indoors, so this is a special treat for me. I signed up for Green Fairy's newsletter. I follow you on Bloglovin, and check it daily!! Thanks for introducing me to this shop. I'm planning some beach and lake time in new jersey! Perhaps a weekend away this year for a break but mostly gardening at home and my allotment, I haven't started my small world yet but my magazine has arrived, at last. I don't have any holiday plans but I'm hoping to get quite a bit of gardening done, once my new raised bed is built! Until then (I have no idea when that will be), I'm going to be trying my best to resist buying plants! I follow your blog - thanks for the giveaway! Love the small world quilt. Such little pieces. Have fun making it. I receive Green Fairy quilts newsletter. It's my first place I look for precuts. this fabric is beautiful, thanks for having the giveaway. this summer we are planning on not a whole lot, some school work and maybe a trip to the beach. I am making quilts all summer, I follow your blog on bloglovin and I signed up for the newsletter, I have purchased fabric from green fairy before. rhona45@hotmail.com thanks for the chance to win! I follow Green Fairy on Bloglovin'. 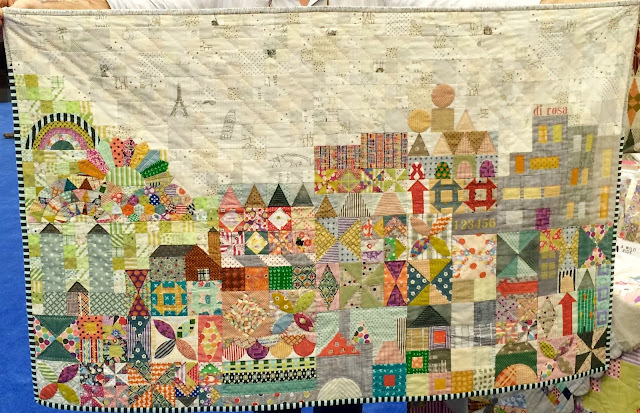 And I love the Small World quilt. Can't wait to see yours! I'm going to visit my son in Amish county. I fallow you on Blogger. We are traveling to visit family and spending some time camping at the beach. I am a regular shopper at Green Fairy and receive their newsletter. My summer is filled with weddings, starting with my youngest! I hope to get more sewing time this summer! Summer plans include travel in our rv to visit family and friends. Nothing planned for summer but work but did take some time off in May and stayed around house. I already get Green Fairy's Newsletter and have ordered from them before. We have a trip to the beach scheduled in July and I can't wait! We took trips in the winter and spring so our summer is about staying home and relaxing. And for me, sewing. I get the Green Fairy newsletter. Love the shop and Judi's amazing quilting! We have a few weekend getaways scheduled, still need to figure out a big vacation plan. Great Giveaway! We are going to Disney World, Florida, with our daughter, son-in-law and 5 year old granddaughter. 22 years since we were last there! Spending a lot of time riding around the back roads of Wisconsin in our 1960 MGA. 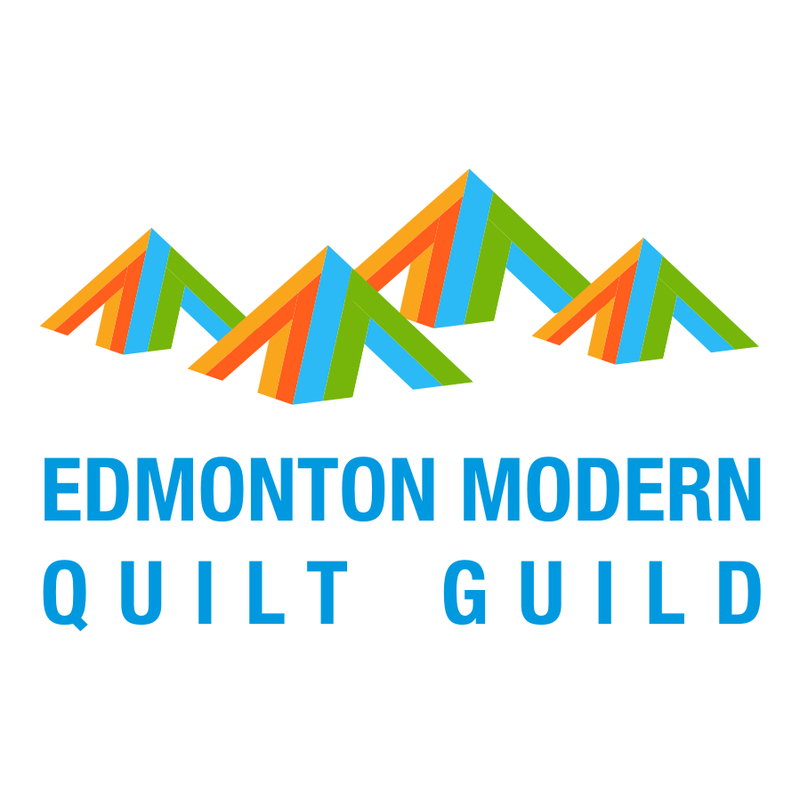 My biggest plans for the summer is a quilting workshop with Cindy Needham. Can't wait. I am working on Jen's 'Small World' quilt. I just love it!! I do follow Green Fairy Quilts newsletter. I follow your blog by email. Thanks for the inspiration all year long! Plan a road trip to pick up some row by row patterns while visiting with a friend. There will also be a quilts in the park event while I am there. What fun! Hi I signed up for Green Fairy Quilts newsletter. What a lovely e-store. I get the shecanquilt emails. Do enjoy your posts. We have friends and family coming in so we're vacationing from home this year. We have several fishing trips planned, a trip out to visit our son and his partner, then another trip way south for an intensive workshop later this summer. I made the "Midnight Over the Oasis" pattern that Jen designed a few years ago, you can see at Good Earth Quilting blog. I follow you by email, Pinterest (auntiepatch), Twitter (Auntiepatch) & FB (Karen Anderson). I already subscribe to Green Fairy newsletter. I plan to sew as much as possible!!! I signed up for the newsletter! Thought I already had before so it was good that I checked! Good morning. I would love to win some Jen Kingwell fabric. I just recently bought her book. Love it! I am presently on a boat and will be spending my summer travelling up the coast of BC in our Kadey Krogen 42. That's how I'm spending my summer! Hand stitching my Dear Jane. I'm already a subscriber to Green Fairy Quilts newsletter, daily emails. Their sales are the best and the customer service too. Thank you Clint and Judi. This summer I'm looking forward to the fall when school starts. I've been babysitting grandchildren. This winter I will be sewing and quilting as much as possible. Leanne I follow you via Bloglovin, email. Your daily inspiration keeps me quilting and sewing, and I so need that relaxation. I'm heading to Girls camp this summer and then to my daughter's house in Houston. It will be warm but fun. Camille at focus20 dot com. We can chat about Jen Kingwell patterns when you come to Inuvik! I am obsessed right now! I signed up for the Green Fairy Newsletter. I have looked at the online shop many times. It looks like a great shop. Thanks for the recommendation. What a beautiful quilt! Being a newbie, I can only aspire to be half as good someday. :) I follow you via e-mail. I follow you via e-mail, and FB. I love visiting my grand baby in Montana. I'm designing a flying geese quilt!